After almost a decade, the trailer of the much awaited film of Ram Gopal Varma Sarkar 3, the third franchise of the Sarkar series, starring Amitabh Bachchan, has released a few moments ago and it is stunning and powerful. This is Amitabh Bachchan’s sixth collaboration with director Ram Gopal Varma after Sarkar (2005). Sarkar 3 is scheduled to hit the screens on April 7 this year. Film Presented by Eros International and produced by Allumbra Entertainment, Wave Cinemas and AB Corp, Sarkar 3 is the third film in Varma’s Sarkar series. 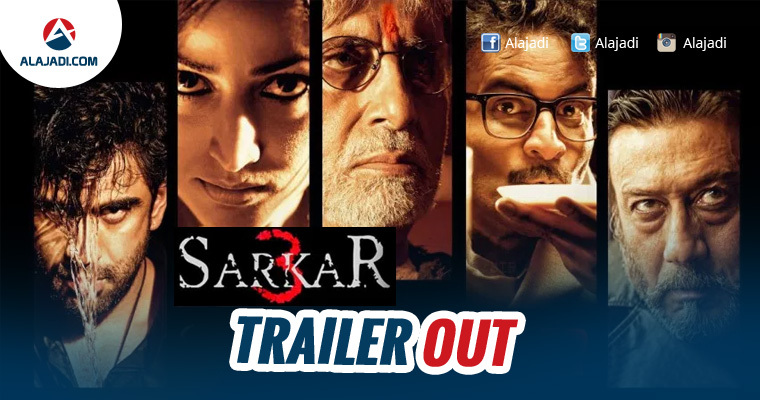 Sarkar 3 trailer is currently available in Eros official website and later it will be uploaded on you tube within the next couple of days. The Film Trailer holds the attention with its gripping action sequences and intense dialogues. The actor looks quite menacing as a ‘wounded lion’ out there avenge the death of his younger son. Through This Film Ram Gopal Varma is back on the Bollywood big screen with his latest venture Sarkar 3. Amitabh Bachchan will be seen in the role of Subhash Sarkar Nagare, Yami Gautam as Annu Karkare, Manoj Bajpayee as Govind Deshpande, Jackie Shroff as Michael Vallya and Rohit Roy as Gokul Satam. The trailer looks more fierce and intense than the earlier parts. Amitabh completely put his feet in the shoes of an old man who is like a dangerous wounded lion, with an aim to take revenge on those who killed his sons. The audience will definitely get to see Yami Gautam and other characters in a new avatar and it seems, Ram Gopal Varma is back with a bang. The background score, dialogues and the narration are top notch. Yami Gautam, who has mostly done glossy and happy-go-lucky characters, is the betrayer and the only woman who aspires to challenge Sarkar aka Subash Nagare. Well, the conspiracy is yet to be broken but the trailer just makes us anxious about what will happen next. We do miss Abhishek Bachchan, but not worry, as the trailer has his glimpses too. It seems after constant box office failures and regular online trolling, RGV has got his game right. All we will say is welcome back Sarkar!